Ben Franklin, George Whitefield, and the surprising friendship that invented America. 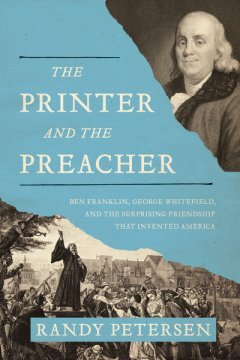 In the words of the publisher, Petersen’s book is a “look at the strange friendship between George Whitefield and Benjamin Franklin, who together defined what it means to be an American.” This is a bold claim and the book doesn’t quite live up to the marketing claims. Yes, the book contains a lot of information on both Ben and George’s backgrounds and how they were shaped in the American colonies. Yes, the book explains how individually, each of the men were influential over the colonies in their own way. What I did not see strongly was any sort of proof that it was specifically because of their friendship that they were able to exert this influence. I do find Petersen very astute to trace the United States’ roots back to Franklin’s individualism and morality, as well as Whitefield’s experiential religious revival. The young United States were heavily influenced by Whitefield’s revivals, and Franklin almost single-handedly invented the nation’s personality of individuality, inventiveness, and resourcefulness. While these are both true, there doesn’t seem to be any special connection between the two that made them more able to leave this impact. It’s a disappointing note on an otherwise excellent book: I would have liked to see Petersen dive into that point in more detail, if it was the point he was trying to make. Other than that, I heartily enjoyed The Printer and the Preacher. It’s well-researched, and each chapter is a fairly distinct unit making it an excellent choice for a slow, nibbling sort of book. I particularly enjoyed the timelines at the end of the book that put everything together in a small space. That alone is enough to earn the book a spot on my bookshelf. Beyond that, the book’s cover and interior are quite attractive. It’s a nice hard-cover with a dust jacket, and the interior is cream paper with nicely-spaced type. I do enjoy a book that’s pleasant as well as interesting to read, and The Printer and the Preacher checks that box nicely. While Petersen’s writing can drag just a little, the book was entertaining and informational. Occasionally his style verges informal, but it’s a solid piece of writing nonetheless. Personally, I feel that Whitefield is under-appreciated in American History, so it was excellent not only to see a good look at him, but a nice study in contrasts with his secular friend, Mr. Franklin. Petersen writes with a clear, unbiased voice, and I never had the sense that he overly favored one man and was making only token efforts to describe the other. The Printer and the Preacher is an excellent biographical history covering the lives of George Whitefield and Benjamin Franklin. It’s an enlightening look behind the scenes of the new United States, and I thoroughly enjoyed it.